Born in Hastings in 1938, he lived in the Hawkes Bay for 10 years before moving with his family to Auckland in the early 1950s, arriving just before the 1951 waterfront strike. He vividly remembers not being able to buy anything during the strike and how, with the rest of the family, he’d sat around the kitchen table painstakingly separating ants from grains of sugar; sugar was a valuable and scarce commodity. Attending Seddon Memorial Technical College in Wellesley Street (now AUT), by day, in the early evening he kept his dreams of the sea alive by walking the Auckland wharves. School wasn’t really Gerry’s thing. Back in the 1950s to pass School Certificate, you needed to pass English. Rather ironically, for the now prolific author, Gerry failed English achieving only 27%. He wrote to the Union Steamship Company asking about a Cadetship but the £150 uniform charge and £100 bond just wasn’t possible for a young 16 year old earning 10 shillings a week (the equivalent of $1 today), delivering newspapers. Putting his dream of a career at sea temporarily on hold, his father arranged a carpentry apprenticeship for him. In December, 1954, with his dream of a career at sea still very much alive, he made the trip across to the Devonport Naval Base to enquire about joining the navy. He was interviewed at the Gunnery School. The Chief Gunnery Instructor thought his technical background would make him a good engineer. Gerry, having just read ‘Cruel Sea’ by Nicholas Monsarrat, wasn’t so keen on the idea. 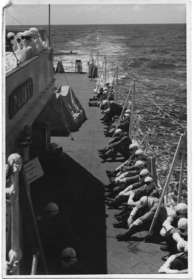 Joining up as a Seaman Boy, Second Class, he began his career in February, 1955, with 32 others in the 33rd Seaman Boys class. Gerry spent his first year as a young recruit at HMNZS Tamaki, on Motuihe Island, where the infamous German Count Felix von Luckner was imprisoned during WW1. He recalls his first job was taking the food scraps to the island’s piggery. Not exactly what you might expect to be doing when you join the Navy! Gerry quickly found himself in the Advanced Class. He credits time in the Sea Cadets and having had the foresight to copy out the Seamanship Manual, Volume 1, as the key to getting the jump on his fellow recruits. Having completed his training, Gerry’s first posting was to the frigate Kaniere sailing for the Far East station on a 16 month deployment. With many key moments in his 26 year career, Gerry recalls time off Christmas Island for the British hydrogen bomb tests whilst serving on HMNZS Pukaki. “We were 80 miles from the drop zone, fully dressed with anti-flash gear. We sat on the deck with our backs to the Ground Zero waiting. When the Valliant bomber released the bomb at 40,000 feet we covered our eyes with our hands. 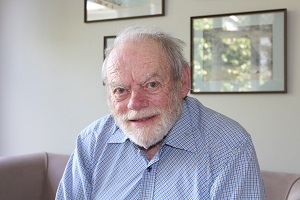 Gerry witnessed five nuclear tests on Pukaki during Operation Grapple. He spent the last four tests in the radar office tracking the weather balloons which were released every six hours. His task was to report the bearing, elevation and range of the balloon to the Royal Navy Meteorological team every minute until the balloon reached at least 60,000 feet. The Met team calculated the wind speed and direction at every 1,000 feet. Gerry rose through the ranks to Lieutenant Commander, commanding HMNZS Haku, HMAS Curlew, HMNZS Inverell and Tui including a six month stint on the British submarine HMS Tabard where he qualified as a submariner. His career included time on HMNZS Santon, a RN minesweeper armed to the teeth (in Gerry’s words), to protect Malaysia and Singapore from Indonesia during the Confrontation. Then in the early 1970s, he attended the inaugural Principal Warfare Course in the UK before joining HMNZS Otago as Operations Officer. Gerry was on board when she was sent to protest French Nuclear testing off Muroroa in 1973. Gerry describes the French device test as being more like a firecracker in contrast to the earlier British tests. He completed his career on the sea in command of HMNZS Tui, a role he thoroughly enjoyed. Retiring from the Navy in 1981, he spent two years running an IHC workshop in Epsom, then took up a role as Nautical Advisor (Oil Pollution) for the Ministry of Transport, Marine Division. Fourteen years later the pull of the sea was too strong, and he returned to the waves, this time as Master for six years of several merchant ships in the South Pacific. History has a way of repeating itself, and things do seem to happen in threes, or at least they do for Gerry Wright! In 1998 Gerry was asked to captain the tug, Stanley Brown on another trip to Muroroa. The plan was for the tug, with a sister tug, to tow a 12,000 ton floating hotel, which had been used to accommodate the decommissioning workers at Mururoa Atoll, to Brisbane. Needless to say, this journey wasn’t without incident including an arrest warrant, an uncooperative engine and a lack of fuel. Not one to be deterred Gerry finally managed to get the tug, his crew and the hotel safely to Brisbane. So how did he go from ship’s captain to author? Largely by chance, with a little bit of mistaken identity thrown in for good m easure. When his youngest daughter came home one evening to report that she’d met someone who knew him and heard how he had been awarded a medal, the name was correct but not the recipient; the real recipient was Lt Cdr Peter Wright. 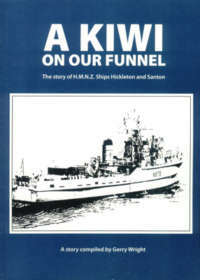 The confusion and lack of information inspired him to start his own research which quickly grew into a book: A Kiwi on our Funnel telling the story of minesweepers, HMNZS Santon and Hickleton. In 2005, the NZ Nuclear Tests Veterans Association were planning a reunion to commemorate the 50th anniversary of the first Christmas Island Hydrogen bomb test. Gerry was asked if he could write a book about Operation Grapple. 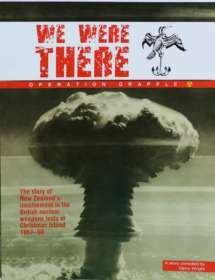 The resulting, ‘We Were There’ was launched at the group’s reunion on 15 May, 2005. Asked which book he has most enjoyed writing, Gerry nominates without any hesitation, ‘North Sea Warrior’ about Jim Macdonald, New Zealand’s most decorated Naval Officer having been awarded the DSO, DSC and two bars and was Mentioned in Despatches on two occasions. He also devised and built a torpedo sight which calculated speed and direction when firing torpedoes from motor torpedo boats, hugely improving accuracy. “He was a fantastic guy, a great leader and showed huge compassion towards his men,” says Gerry. With nearly 20 books to his name, Gerry continues to self-publish. An early piece of feedback from a prospective publisher that he needed to include a love story in his book, convinced Gerry that self-publishing was the way to go! Husband to Liz for 48 years and father of two daughters and one son, Philippa, Bridget and Timothy, none of whom have followed him into a career on the sea, and six grandchildren. However, he does credit Bridget for sparking the idea of becoming a writer. Gerry has no plans to slow down with a veritable sea of ideas still on the horizon.